Ned, whatever magic that you and your Pentax great colleagues have done on the high ISO noise, can you think of back-porting the improvement as an option to Pentax K-7 so that we are in full blown of improvements on noise not just on K-x but also on K-7. It would be odd to see substantial improvement on noise on the entry level camera from Pentax but not on the flagship product with K-7. I am likely to get K-7 and K-x and it would have been nice if K-7 has the high ISO capability with the K-x. Just a thought, please forgive me to be straight. We need honest talks and right to the point. Hope you take it positively. I find it intriguing that Pentax seems to pull out their best performance in noise control into the making of Pentax K-x. Its sample pictures in ISO 3200 and ISO 6400 are very appealing to me to say the least. Unlike certain Full Frame enthusiasts who have been whining their discontent in not having full frame, their story mainly concentrate on the best in noise control which Pentax is not the best option but I would say this -- Pentax K20D are quite good up to ISO 800 with solid performance and very reasonable for shots up to ISO 1600. However, shots beyond ISO 1600 seem to degrade quite drastically subject to the lighting scenes and lens mounted. I did a shooting for staged dance performance and I can attest that many of my shots in ISO 400 to 1600 come out very satisfactory for me and quite a number of keepers and good shots between 1600 to 3200 but it really gets to my comfort zone to shoot anything above ISO 1600 and not worry about noise. With the coming of Pentax K-x with a Sony Cmos sensor, likely the similar one shared by Nikon latest top models, I am baffled to find much improvements on noise in ISO 3200 to 6400. With K-x, my impressions so far seem to indicate that I can shoot confidently from ISO 1600 to 3200 and not have to worry too much about noise. What happens to K-7, if I have to give my impressions. It looks as if K-7 is at best in par with K20D and vary slightly both ways in terms of noise. I am not trying to step down on Pentax like RH and others are as Pentax K-7 is really a total revamp with a leap of bold moves with lots of improvement and substantial features on video, level indicator, better frame rates at 5.2 fps, quiet AF and better body overall just to name a few. All improvement really make K-7 a good competitor to Nikon D300 and Canon 50D for me. But the similar noise performance in K-7 seems to give competition reasons to doubt on the wonderful flagship product of Pentax. It would have been a clear winner if K-7 has the noise improvements made in K-x. I am still undecided as to which camera to get first. Should I get a K-x first and then K-7. Or should I go with K-7 and forget about K-x. I am sophisticated guy who wants the best from Pentax and yet I am a stylish guy who may go out the extra miles to compromise for a smaller and more stylish camera for traveling and backup purpose. I need to think it through as I don't want to rush into the decision. Patience will reward me for the ultimate dual body system that I need. 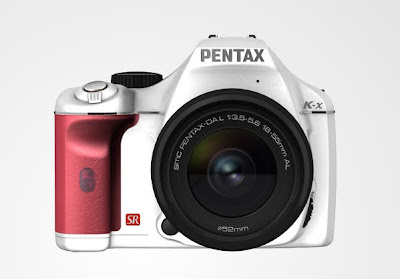 I have made the purchase of the Pentax K-x White and decided to postpone the purchase decision on K-7 indefinitely. I just got the K7 last week. I'm not seeing this noise problem. Maybe it's just me, but I find the images stunning, it's really small in a very good way, and it feels even more robust than the K20 or K10. Amazon had it for $1100. Now I know if I had waited until after Xmas it would probably be $1000. Personally, I think this noise discussion is just that noise. I would read Gordon Lewis' three part review on the K7 on the Online Photographer. It exactly corresponds to my experience with the K7 so far. That said, he's seems to be more of a photographer than an engineer. They really are two different things. I'm not saying one is right and the other one wrong. It's just two different ways of looking at photography. Also- I spent the day yesterday going through my zooms. I may be moving rather far away and need to reduce the load. Plus I really just prefer primes. If you are interested I am thinking of getting rid of a few. Why don't you email me sometime and let me know. No hurry. I don't want much for them (probably much less than I paid on Ebay and I bid low). Second is , You cannot claim to know a new gadget (DSLR) not until you really live with it. Use it everyday , learn more about what can it do or how can it produce a kind of tones you really like. But as LAZYLY saying "UNLIKE the other dslr", and that doesn't count your claim that you really know pentax K-7... C'mon Get a life !!! @Stanleyk, I think I may have a wrong tone in the blog post that I did in a hurry. I don't mean to be condescending on K-7. It is the best camera and it is going to be my camera of choice when I compare with Nikon D300 and Canon 50D. Noise is an subjective opinion. I am more of a amateur photographer than a junior engineer. I can't find supporting evidences that K-7 beats K20D on noise and so I read up all reports comparing noises between K20D and K-7 and arrive at the impressions taht K-7 is as good as K20D in terms of noise control and vary slightly both ways on occasions. There is no comparison that K-7 is a better camera than K20D as the AF, body, leveling, and metering are much improved. The sad truth is that the masses are concentrating on the negatives and 1 single minor point may overshadow the others. And with K-x showing better noise control, I am swayed a bit to the K-x and hope that K-7 can be back-ported with noise improvement if it is feasible for the company to do. I doubt it as it is likely the results of better Cmos sensor from Sony instead of Samsun -- it is my un-informed guess and I have no proof for it except blog readings. I wish I can join you quickly to have a copy of K-7. But in order to do that, I can't purchase more lenses. I am someone easily tempted with lenses. @Javier, the noise in K20D is quite good. But of course, I will hope that K-7 can handle noise better. But noise aside, it has everything that I want in the AF and metering improvements. The big one is on the smaller form factor, leveling device and the video. I am likely to get both but at different time. Something like K-7 in X-mas if it cost below $1000 and K-x when others have reviewed it properly. I am concerned about the missing of focus confirmation as a red dot on the focal point as I do rely not only on the beep but also on the signal of red point in the focal point for focusing. The beep is not loud enough in a busy street, a sport game or a race track for me, and the visual signal form the red dot with the selected focal point or the diamond shape on bottom of the viewfinder is important to me, I need to look further into it. It is a small annoyance otherwise and I will compromise on the positives from K-x. Likely when it is about $500 body only which is already close at current price point -- it is a bargain if you ask me. No doubt, the new Sony sensor shines for what concerns noise, but for me the camera of choice would be the K-7. The tropicalized body is a factor of choice (one of the reasons why i bought a K10D instead of a D80) ... Winter here is quite cold and humid, and i don't like to leave my camera at home ;-) ... Moreover, more than once i have been shooting under the rain. Buy more photo trips, not camera bodies! After a week of use, I would go with the K7 if you can afford it. It's really a remarkable camera. I am trying right now to figure out how to package my K10 and K20 to get enough $ to buy a second one for my M42 lenses. I just hate taking that adapter off in the field. I'm going to go through my lenses this weekend and send you an email. I am moving soon and really need to minimize my stuff. No offense taken by the way. I am just so happy with the K7. It really is a great camera. I've notice you go out shooting a lot. It's really a joy to carry because of it's size and weight. However, it feels like it could get run over by a tank and not be phased. I guess that's more of what I'm looking for in a camera so take that for what its worth. I am a real outdoors person (no matter the weather). I really love cold weather (as does my dog) so when it does get below 50 degress here, I'm always outside. I have a black lab mix and we do a lot of camping hiking. My personal feeling is there isn't one right camera for everyone. You just have to find the one that is right for you. I really do like the colors though. If they offer some of the choices that they have in Japan, I would be VERY tempted. BTW- Didn't you get a 645? If so I'd be curious to know how you like it. K-7 vs K-x is not just about the noise. For me it's more about the DR.
K-20 and K-7 do a remarkable job with the high lights. However, they lose it in the shadows, with reduced DR and noise. It seems the K-x has solved that problem. It seems the DR improvement is mostly in shadows, which is a hugh plus for Pentax. I remain interested in the K-7 as I think it could easily replace (and be paid for by selling) my existing *ist DS2, K10D, and K20D. It really seems ideal for me--the quality construction, quiet & slick-sounding shutter, 100% viewfinder, and high-res LCD all appeal a lot to me. Yes, the K-x is the bee's-knees for high ISO but other than that it doesn't offer that much for me. There's a good chance that'll I'll get one after Christmas, maybe take advantage of the rebate.